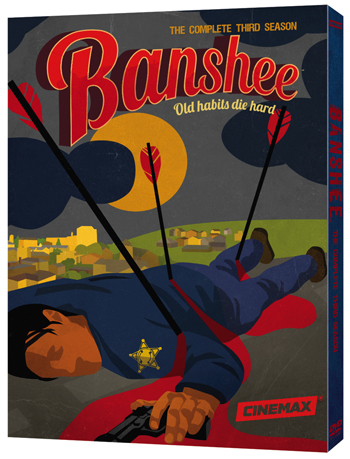 New York, N.Y. – Created by Jonathan Tropper and David Schickler, the Cinemax action-drama Banshee charts the continuing twists and turns that follow Lucas Hood (Antony Starr), an ex-convict who improbably assumes the identity of sheriff of the rural, Amish-area town of Banshee, Pa., where his former lover and partner-in-crime has been living under her own alias, Carrie Hopewell (Ivana Milicevic). This action-packed series has developed a devoted fan base of “Fanshees” who are hooked on the high-octane storytelling and compelling characters. 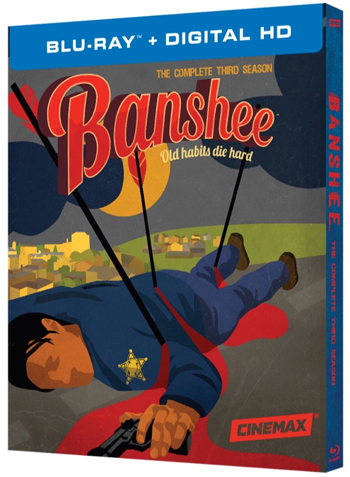 Timed to its fourth and final season this winter, Banshee: The Complete Third Season debuts on Blu-ray ($34.98; includes free Digital HD copy) and DVD ($26.95) on April 5, 2016. The release is loaded with extensive bonus content taking “Fanshees” behind the scenes of the show. Season 3 picks up a month after the Season 2 finale, when Carrie’s father, gang kingpin Rabbit (Ben Cross), finally met his demise after a climactic church shootout. Carrie, now exposed and estranged from her husband and kids, remains in Banshee, working as a waitress by day while moonlighting with Lucas, Sugar Bates (Frankie Faison) and Job (Hoon Lee) on a variety of local heists. As Lucas finds it harder and harder to keep his true identity from his deputies – especially Siobhan Kelly (Trieste Kelly Dunn), now his romantic interest – he and the Banshee police force become embroiled in a new conflict between Amish gangster Kai Proctor (Ulrich Thomsen) and Chayton Littlestone (Geno Segers), the vicious, vengeance-minded leader of the Redbone wing of the Kinaho tribe. And as fists and bullets fly in and around Banshee, Lucas concocts a new scheme that could net his thieves a fortune – by robbing a decommissioned Marine compound housing millions of dollars.